Welcome to the Monument Entertainment Blog! We are pleased to have you here and to share with you the latest industry news and updates regarding the great artists and models that make up our talent pool. Have you ever been touched by a song? The kind of song that makes you thrust your fist high in the air with exuberance or tap your toes on the ground. What about the kind of song that makes you wipe that lone tear from the corner of your eye? Music should make you feel some kind of way. Music is inspirational. Music is healing. Music is powerful. The music business is stocked full with talented artists. And there are probably tens of thousands of unknowns trying to break into the business. Tune into any number of reality shows on TV and you’ll see a bunch of kids with dreams and a guitar trying to strum and croon their way to Hollywood. Some are very good and some…well. Then there are those who are exceptionally talented, the ones who put in the hard work day after day for years to hone their craft. They write their own material and they build up a fan base by performing every chance they get. Not only do they have the gifts to inspire, they have the drive to succeed. It’s my pleasure to introduce you to Cody Webb. In 2011, Cody released his first single, “4 Years Into 5” to critical acclaim. Since then he’s recorded three solid CDs. His third offering “I Ain’t No Quitter” not only sums up Cody’s never quit attitude it also delivered his most popular track to date “Mudd Bogg”. The single rose quickly up the charts and firmly established Cody as a rising star. Still the question remains; who is Cody Webb? Just take a listen to his music and it’s easy to tell that Cody is country music through and through. There’s no pretense with Cody. His sincerity and love for his country roots are front and center in his verses. Cody weaves genuine tales of love, making an honest wage, and having a whole lot of good fun. He loves tall trucks, cold beer, and southern girls. 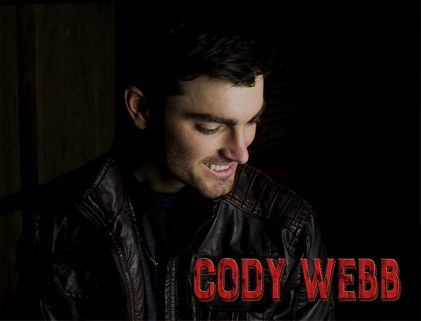 The last time I had your undivided attention, I told y’all about Cody Webb, the rising songwriter, musician and star. Now that you know who Cody Webb is, let me tell you what he’s been up to lately. Cody’s been awfully busy. Cody is a songwriter so he’s been real busy writing heartfelt songs inspired by his own life, the kind of songs that resonate with so many who love country music. Cody is also a musician so he’s been real busy performing at venues throughout the South making new friends and fans with his feel good brand of music and the fans are responding. During Cody’s recent CD release party held at Augusta’s (Georgia) Country Club Saloon and Dance Hall, more than 800 fans packed the place to hear and see Cody perform live. Cody did not disappoint. Cody worked up the crowd with songs from his latest CD “Backwoods Bucket List” as well as fan faves like “Mudd Bogg”, “Bang” and others from his earlier releases. So much so that during the band’s break, Cody stayed on stage and kept the crowd singing and dancing along with him. “Wow this guy is really good. Had not heard of him before tonight.” one attendee yelled. Another concert-goer replied, “Cody sure can get a crowd going". And another said, “I really liked the music to “Redneckognize”, I’m gonna download that one tonight.”. The venue’s management took a real liking to Cody as well and booked him for another show in June. Cody is in demand. The bottom line is when Cody pulls into town he’s picking up new fans and gaining momentum with every show. Just take a listen and you’ll get onboard. The Cody Webb train is coming through. The Cody train is coming through.